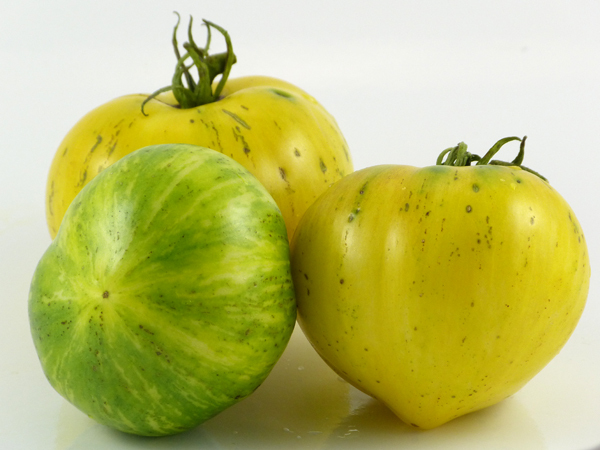 “Beauty Mark” is a variety created by Tom Wagner, of White Beauty x (F8) Brandy Stripe. Note: Vintage Wine was developed from a selection from the Brandy Stripe line. Mr. Wagner posted two descriptions of Beauty Mark: “Regular leaf, not woolly, clear epidermis, vivid red stripe and white flesh to boot. Just a bit hard to see stripes on overly ripe fruit. Good fruit size around 3 inches.” – Mr. Wagner's Tatermater Proboards. 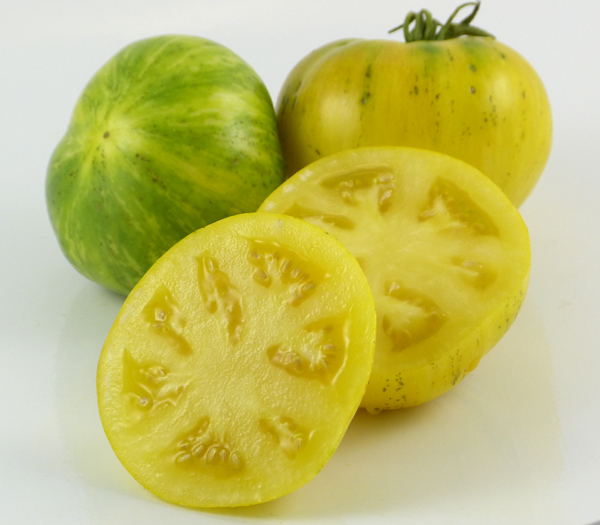 “Indeterminate, striped white tomato with hints of Brandywine” – Mr. Wagner's seed vendor site. I am not sure how there could be a vivid red stripe. How does a gold stripe turn into a vivid red stripe? And how would it be difficult to see vivid red stripes on mature white (white flesh, clear epidermis) fruit. So I believe that there was a disconnect somewhere. But I am also wondering about the name, Beauty Mark, for a particular reason. 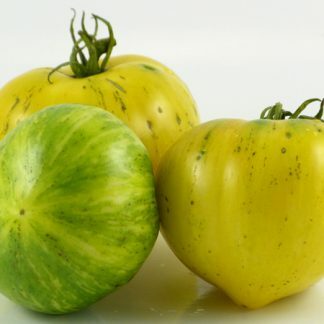 No mention of spots or specks is found in the original description; however, there is a photo posted by another grower, which shows a heart-shaped white fruit with yellow stripes, and specks/spots. Specks/spots similar to Freckled Child, Scabitha, and those types, which were bred purposely that way. Mr. Wagner acknowledged the photo as a representation of Beauty Mark. 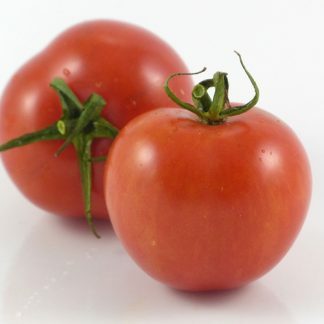 “The disease formerly known as tomato fruit pox was shown to consist of two diseases each with distinct symptom patterns. The two diseases were found to be separate and distinct when studied in the field and laboratory and were named fruit, pox and gold fleck. 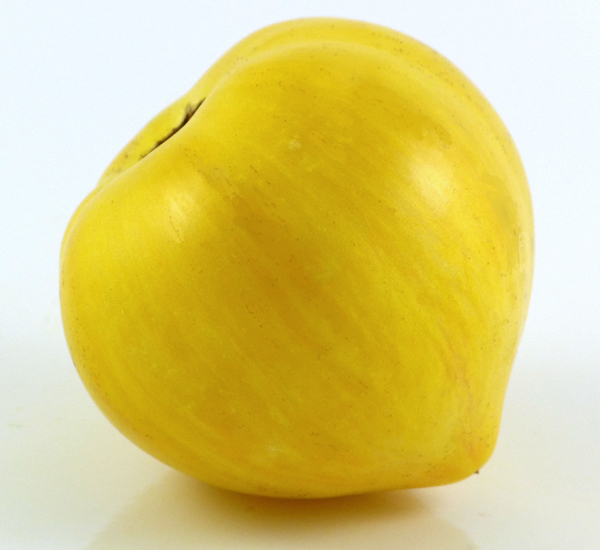 Fruit pox was shown to be controlled by a recessive gene designated (fp) and gold fleck by a dominant gene designated as (GU). Maternal effects on expression of both characters were absent and dominance apparently complete” (Crill, Burgis, Jones, & Strobel, 1973, p. 1285). Crill, P., Burgis, D. S., Jones, J. P., & Strobel, J. W. (1973). 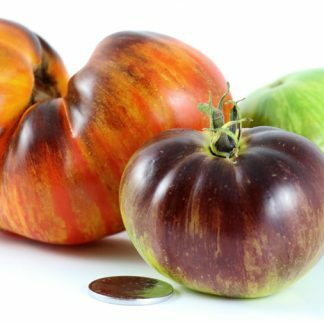 The Fruit Pox and Gold Fleck syndromes of tomato. Phytopathology, 63, 1285-1287. So now that I know what this is genetically, I was able to research those vague references to “environmental conditions.” Under conditions of high air humidity, some also say high heat, and high Ca/K ratios, more calcium is transported into the fruit and the incidence of these two genetic conditions increases expression (visibility). Looking closely at my photos, I can discern fruit pox. I cannot see gold speck, but that may be due to the fruit coloration hiding it. But with fruit pox, a homozygous recessive gene (fp), I know that both parents carry this gene. So I looked over the Internet for photos that showed Brandy Stripes and White Beauty with fruit pox. There are many more photos of Vintage Wine than of Brandy Stripes, so considering the relation between them, I included Vintage Wine in my search. And I found them! Not many, because of course who wants to publish photos of pox marked fruit on the Internet? It makes a difference when these conditions are bred specifically and purposely into the variety, such as in Freckled Child. I can therefore say with near certainty that both parents of Beauty Mark carry the fp gene. NOTE: If you grow this variety under conditions that do not include high humidity, high heat, and high Ca/K ratios, your fruits should look like the third photo, the white/yellow striped heart without specks/spots/pox.